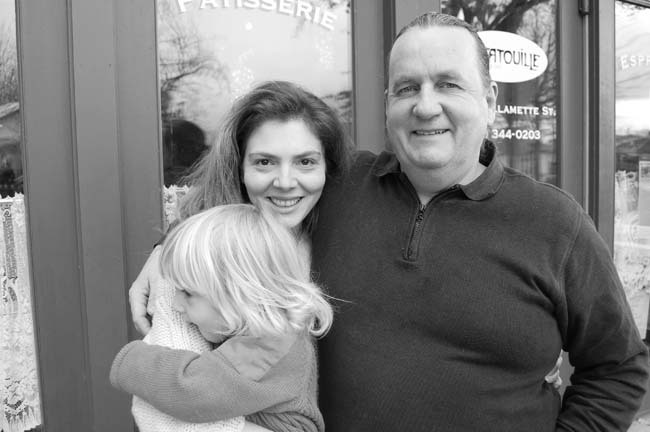 "It's a family business," says Eric Bertrand, proprietor and chef at Ratatouille on Willamette Street, a Parisian-style cafe where the food is vegetarian, organic, fresh, and locally grown. "It's about sustainability, a community goal in harmony with the earth." Raised in Aurignac, a village in the French Pyrenees where people grew their own food, Bertrand got started in restaurants at age 13, and had his own restaurant in downtown Toulouse by age 24. After an illness and five years of recovery in the Marquesas Islands, where he was adopted by a local tribe, Bertrand moved to San Francisco in 1992. He learned English and met his wife Anahid, an Armenian from Bulgaria and a confirmed vegetarian who was studying music at Sonoma State. Together they took over Sparks, a vegan eatery, and made it the top-rated vegetarian restaurant in the Bay Area. When Sebastien was born in 2005, they moved to Eugene. "I found Eugene when I was a flight attendant," says Anahid, who now teaches music to kids. Eric was executive chef for Sundance before opening Ratatouille in 2008. "We cook for the Sundance deli," he notes. "We have their reserve wines and spectacuar wine tastings once a month."